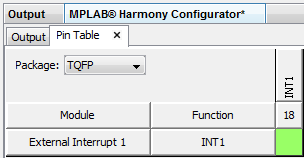 This article describes the process of creating a simple Wi-Fi and Ethernet application on a PIC®32MX microcontroller using the MPLAB® Harmony software framework. The concept is equally applicable when you want to add Wi-Fi® and/or Ethernet functionality to an existing PIC32 Harmony project. PIC32MZEF Curiosity Development Board, etc. You can also use this article in combination with online help available on Microchip Developer Help (click here) and replace the Wi-Fi function with Ethernet. The Developer Help website contains a lot of interesting Harmony tutorials including peripherals and middleware. You will implement a TCP server running on the PIC32 microcontroller which is connected to a local Wi-Fi network through WINC1500 module in Bypass mode (i.e. 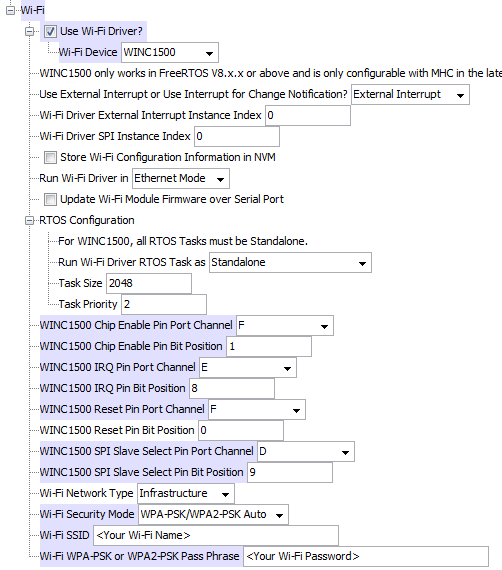 using Harmony TCP/IP Stack instead of the on-board WINC TCP/IP Stack). At present, the Harmony driver for WINC1500 is only supported with FreeRTOS™ to maintain the non-blocking behavior of Harmony framework. 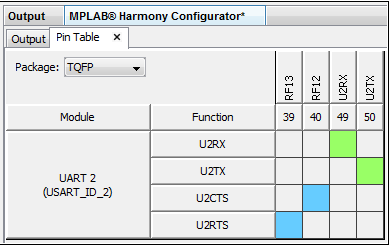 You will use the latest FreeRTOS version that is bundled with the Harmony installation. The “Application templates” feature in Harmony provides a good base to build custom applications. You will use the TCP server template to write your code. Once Wi-Fi is working, you will extend this project by adding the Ethernet function to it. Start MPLAB X IDE and create a 'new project'. Select '32-bit MPLAB Harmony Project'. Complete the Harmony project details as shown in the image below. You can keep the default Project Location in the applications folder or set a desired one as shown below. Enter an appropriate 'Configuration Name'. If there is no target board available for your microcontroller, leave it blank. It is helpful for importing respective board support package. Click on the Finish button to create a project which launches the MHC by default. 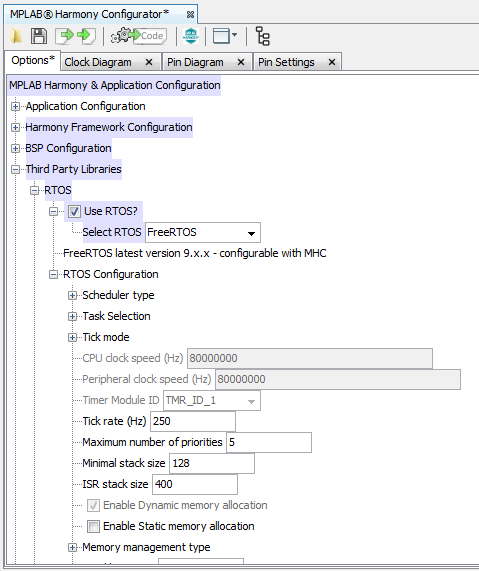 Select the first FreeRTOS option which is the latest version. The increased stack and heap sizes are to accommodate TCP/IP and Wi-Fi driver tasks. Note that timer and clock speed options are locked to specified values. 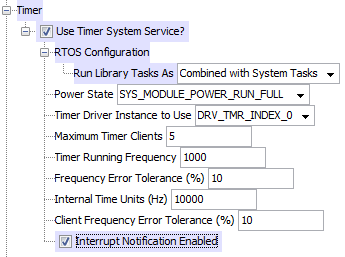 This indicates Timer 1 is used by FreeRTOS to manage ticks. 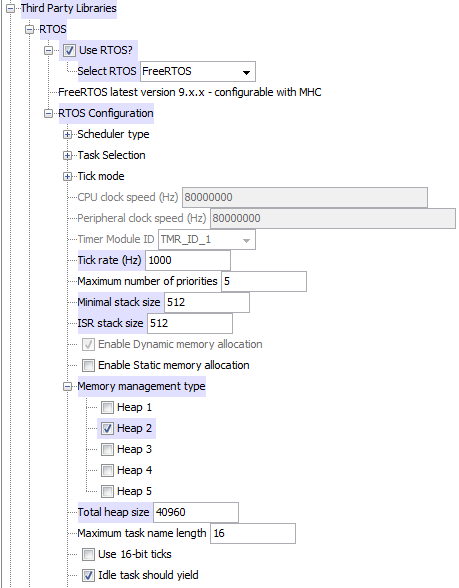 Each module (drivers and system services) in MHC will contain its own RTOS configuration settings which will be addressed in following sections. For now you are creating only one application. This is your Wi-Fi network application. If you want, change the TCP template parameters (port, text, etc.). Otherwise keep them as default. If you are adding a new application to an existing project, make sure you increment the 'Number of Applications' number and select appropriate 'Application-‘n’-Configuration'. MHC will highlight a conflict at this point. You may notice grayed out modules in MHC. Ignore them for now. You will resolve them later. 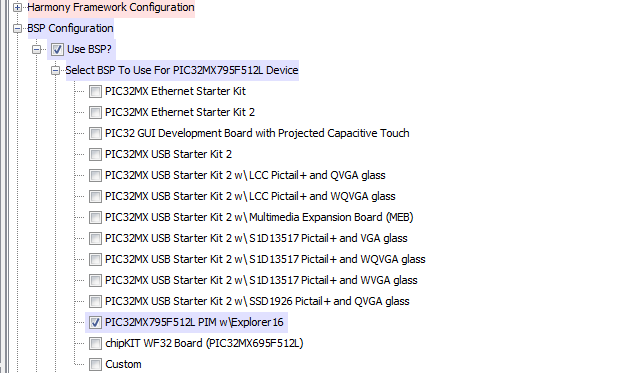 Under 'Select BSP To Use For PIC32MX795F512L Device' check the 'PIC32MX795F512L PIM w\Explorer 16' box to enable it. 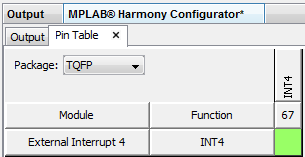 Under the MPLAB Harmony Configurator 'Options' tab, expand the 'Harmony Framework Configuration' tree. At this point, you have configured a FreeRTOS system task and FreeRTOS application task. To achieve consistency with the Harmony structure without RTOS (i.e. 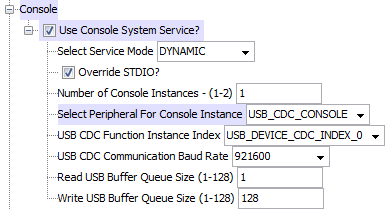 a SYS_Tasks() super loop), MHC will provide you a choice to include further driver tasks as a part of 'system task' or to be 'standalone task'. You will set drivers and systems services as part of 'system task' whereas Wi-Fi driver has to be run as 'standalone task'. The WINC1500 Wi-Fi driver uses the Debug system service to send logs to the console output. Under 'Harmony Framework Configuration', expand 'System Services'. Check the 'Use Reset System Service?' to enable it if not already enabled. MHC has interdependencies between modules. Enabling one module sometimes enables the dependent modules. For any embedded project, it is important to have a way of printing messages to the console for debugging purposes. For this project, you will use the Harmony Command and Console System Service to send messages to a host computer using the UART module. The Explorer 16 board features a UART communication interface (Refer to the Explorer 16 User’s Guide). 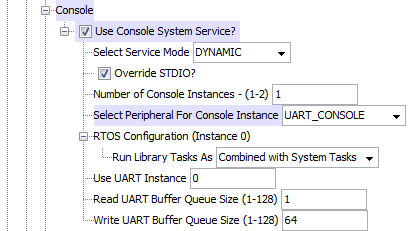 In the following steps, you will be configuring the corresponding UART driver to work with the console service. Under 'Harmony Framework Configuration' expand 'Drivers'. 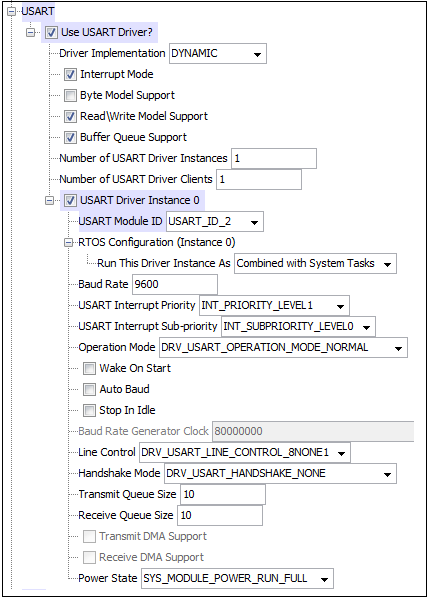 The 'Use USART Driver?' module should already be enabled because of the previous step. This is because the Explorer 16 board UART2 is connected to the UART interface. 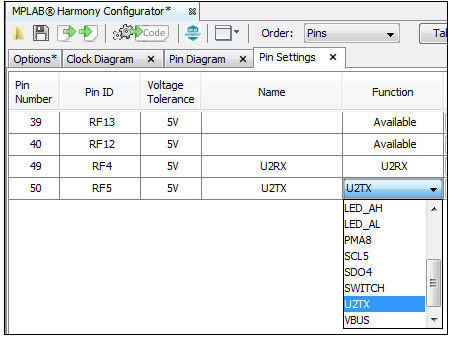 To complete UART driver configuration you will need to assign Tx/Rx pins for UART2 module. 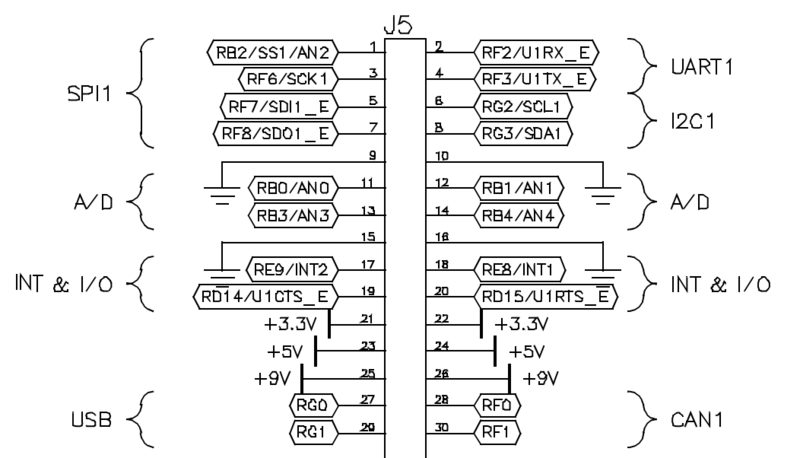 From the schematics (Refer to Explorer 16 User's Guide), note that U2RX is pin-49 (RF4) and U2TX is pin-50 (RF5). Sometimes there may be a conflict with pin assignments. You will need to un-assign them from the pin table first. You can right click on module name in Pin Table and isolate them for a better view as shown above. To revert, right click on module name>show> all. 'Use TCP/IP Stack?' should already be enabled due to the TCP template configuration in Step 3. The TCP/IP Stack can support multiple network interfaces. For example, you can have a single Wi-Fi or simultaneous Ethernet and Wi-Fi interfaces defined here. For this article, you will only use one Wi-Fi instance. 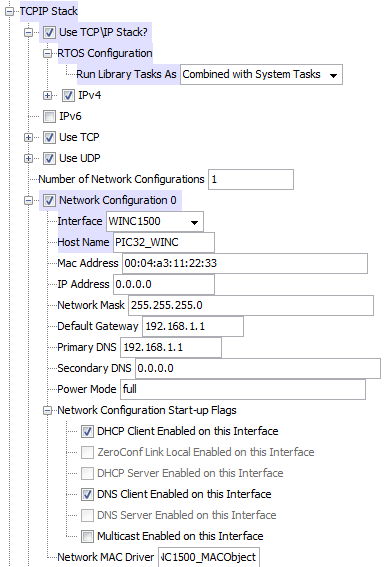 Leave other network parameters for the TCP/IP Stack to configure since we use DHCP client to get valid IP address (if you want to use static IP, enter it here and disable DHCP client). 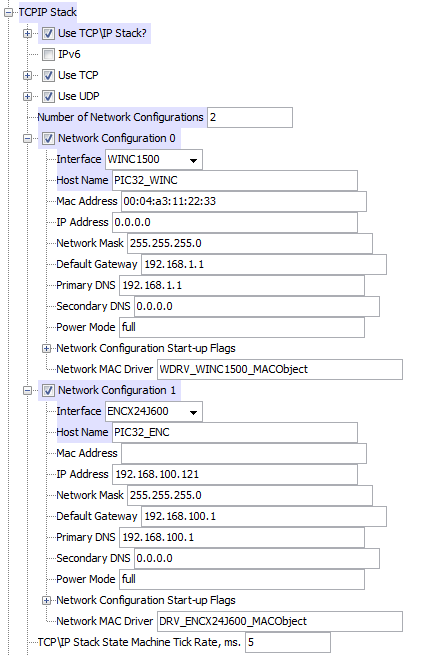 Under 'Network Configuration Start-up Flags', make sure that 'DNS Client Enabled on this Interface' is checked. This will allow you to use the ping service. 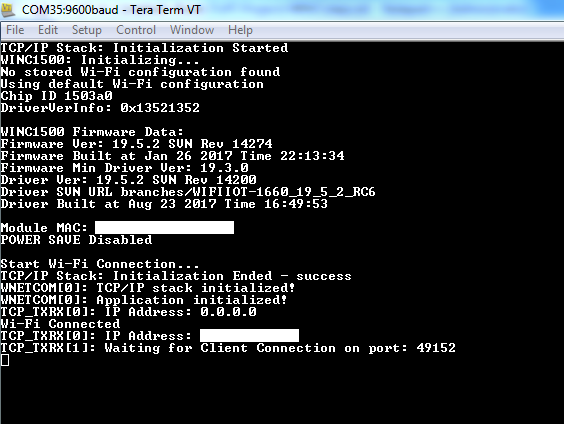 At this point, you will need to configure corresponding drivers and services for the TCP/IP Stack. The TCP/IP Stack uses Timer System Service to keep track of all the timeout events. 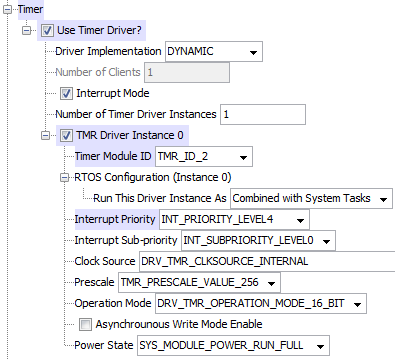 After looking at the Timer System Service, you will notice that it uses 'Timer Driver instance 0'. This means you will need to configure both Timer System Service and Timer Driver (which will be done in this Step). Also, since the PIC32 communicates to the WINC1500 module via an SPI interface on the Explorer 16 board, you need to configure two drivers: Wi-Fi (Step 10) and SPI (Step 12). In Timer driver, MHC has detected a conflict. Expand it to see why. 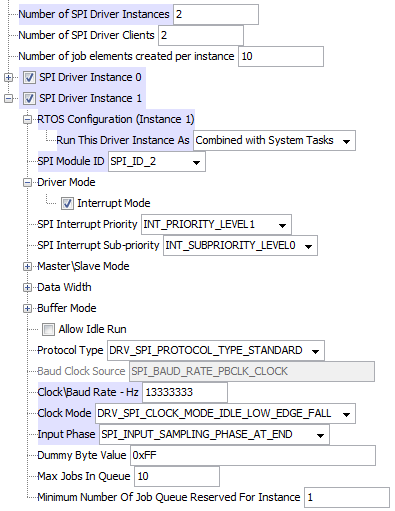 Remember that Timer 1 is already dedicated to FreeRTOS. This should resolve the conflict. This is important because enabling the TCP module in Step 3 - Setting up FreeRTOS Application Task(s) enables the Ethernet driver by default. In order to use Wi-Fi, you must disable it for this project. 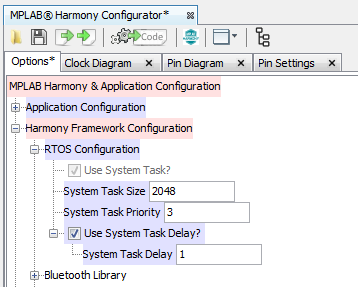 Go to the Harmony 'Pin Settings' tab and change 'Function' for pin number 87 (RF0) and 88 (RF1) to GPIO_OUT. These two pins are Reset and Chip Enable. You will set the SPI pins later in Step 12. Note that you will be using the External Interrupt for Change Notification. 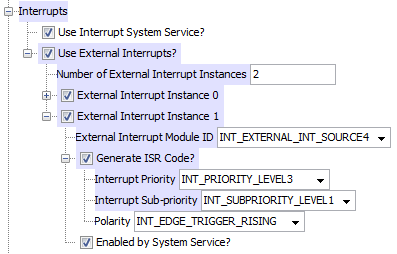 This means you need to configure External Interrupt Service under 'System Services' (Step 11). External interrupts will be used by the Wi-Fi driver. This will connect the WINC1500 interrupt pin to the PIC32 INT1 pin. 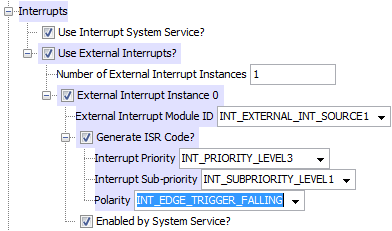 Assign pin 18 (RE8) to the External Interrupt 1 module. You will be using the SPI driver in interrupt mode. 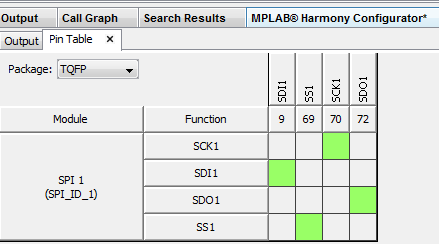 You may see MHC showing SPI driver grayed out. SS1 = pin 69 (RD9). Click on the Generate Code button in the MHC toolbar. Save the configuration in next popup window. 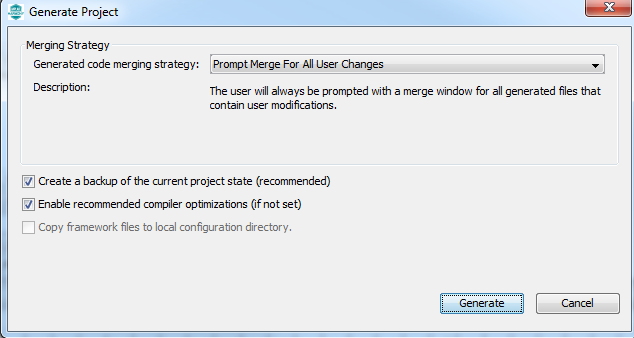 In the Generate Project window ,select desired merging strategy and click Generate. You will notice several source files and header files created in the project window. main.c file has the generic state machine while loop. wnetcom.c file is your application file where you will be writing and updating code. All the variable and state names will be coherent with your application name defined in Step 3. In this section you will write a simple LED toggle application which receives commands from the Tera Term terminal emulation program which acts as a TCP Client. Check if TCP/IP Stack is successfully initialized. Proceed after successful initialization. Wait till the interface receives a valid IP address from DHCP server. After receiving a valid IP, open a TCP server socket on the specified port. Wait for incoming connection from a TCP Client. Wait for any messages from the client and parse them. Toggle LED on Explorer 16 board if a valid message is received. Keep checking the connection continuously. Notify when the client disconnects. Go back to step (5). By referring to the code flow above and the API functions, analyze the application structure. Let’s start adding code to your application file. (Line numbers in the images are for reference only and may vary in your project). In WNETCOM_Tasks() function and WNETCOM_STATE_INIT state, Change the appInitialized declaration to false. If TCPIP_STACK_Status() returns a negative value, notify user that TCP Stack Initialization has failed. You will use the console service API to send formatted strings to the serial terminal. Make sure you put console print statements before state variable changes in code. Otherwise the logs may be confusing! 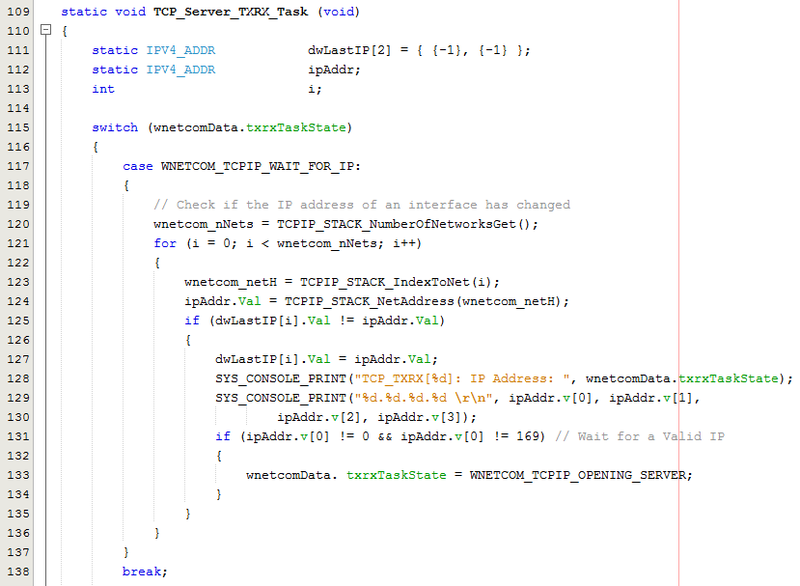 Add these lines to set appInitialized equal to true when the TCP/IP Stack becomes ready and display a message. Add another console message while exiting the WNETCOM_STATE_INIT state. At this point, the function WNETCOM_Tasks() enters state WNETCOM_STATE_SERVICE_TASKS where it is executing TCP_Server_TXRX_Task() continuously. This function maintains its own state machine to handle the TCP server. Once a valid IP Address is received, proceed to open a TCP server. Add a couple of console statements to WNETCOM_TCPIP_OPENING_SERVER state for checking (code locations as shown in image below). Wait till you receive a connection. You can implement a timeout here using a Timer if you want. Send a greeting to the client and change state to wait for client response in the state WNETCOM_TCPIP_WAIT_FOR_CONNECTION. 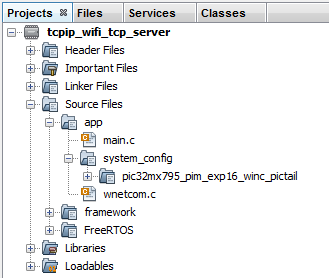 Modify WNETCOM_TCPIP_WAIT_FOR_RESPONSE state so that if connection is closed, state will be changed to WNETCOM_TCPIP_WAIT_FOR_CONNECTION. If data is received from the client, parse it and add logic for toggling LED’s. All the necessary changes are complete. Feel free to modify the parsing code, add more states to the TXRX function to handle the closing of sockets, or implement timeout for sockets and so on. Do not program the device yet. IMPORTANT: If you modify MHC and regenerate the code it will try to overwrite the application file(s) with a fresh template each time. Pay attention to the merge window generated after MHC generate action and keep the custom code as it is. Connect the serial port connector on Explorer 16 board to the host computer. Connect the WINC1500 PICtail in top socket of J5 connector (SPI1). Connect power supply and programmer tool to the Explorer 16 board. For the Wi-Fi portion of this project, you can plug in only the WINC1500 PICtail Plus daughter board. The ENC624J600 PICtail Plus will be used later. 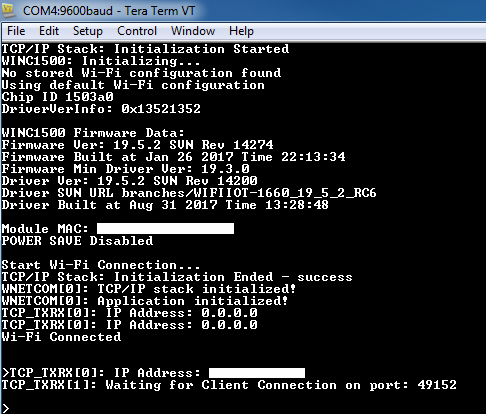 Open Tera Term and select the serial interface instance created by Explorer 16 board. You may see a different COM# number. It will open a blank terminal window. Click Make and Program Device Main Project icon in the MPLAB X IDE toolbar. Once the PIC32 is successfully programmed, you will see the following messages on the serial terminal. These messages include system debug messages as well as console print statements that you just put in. Numbers in square brackets are the state numbers from respective functions for easier debugging. In the newly opened TCP connection, you will receive the greeting from TCP server on PIC32. Enter LED toggle commands as toggle D3 and notice the output on the Explorer 16 board and the serial terminal. Close the TCP client terminal and notice the output in the console. You can open a new TCP connection and test more. Now that you have a working Wi-Fi project you can extend its functionality by adding Ethernet so that you can have simultaneous Wi-Fi and Ethernet. In this step you will be configuring the TCP/IP stack to communicate with the Ethernet driver. 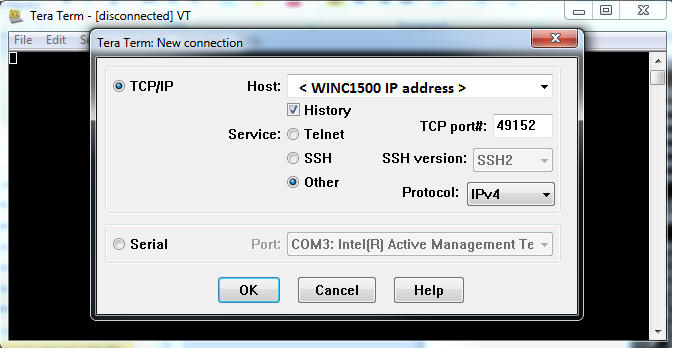 The TCP/IP Stack is already configured for one network interface: WINC1500. 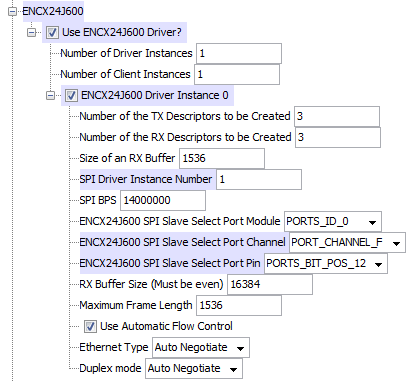 In this step, you will be configuring the ENCx24J600 driver. 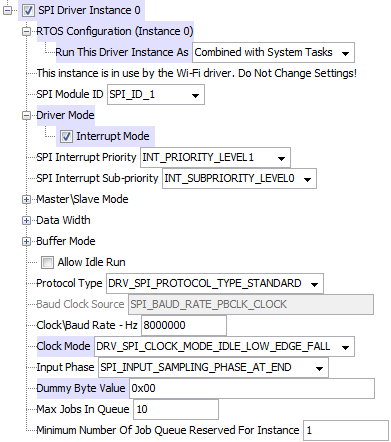 This is because the SPI driver instance 0 is communicating with the WINC1500 Wi-Fi module. 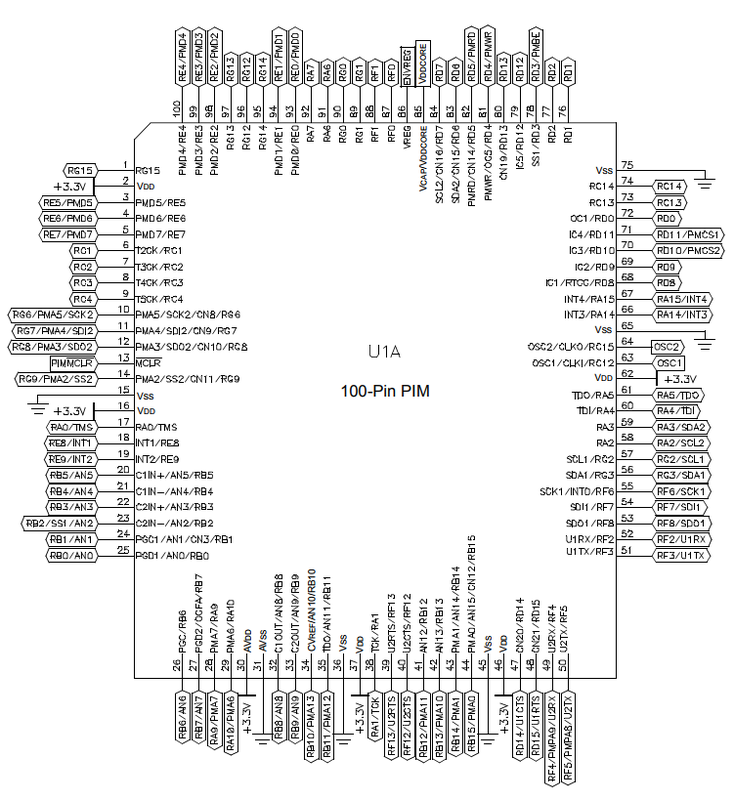 To identify pin mappings for ENCx24J600 module refer to Appendix A-2. Change the Direction (TRIS) and Latch (LAT) of RF12 (pin 40) and RF13 (pin 39) to Out and High. 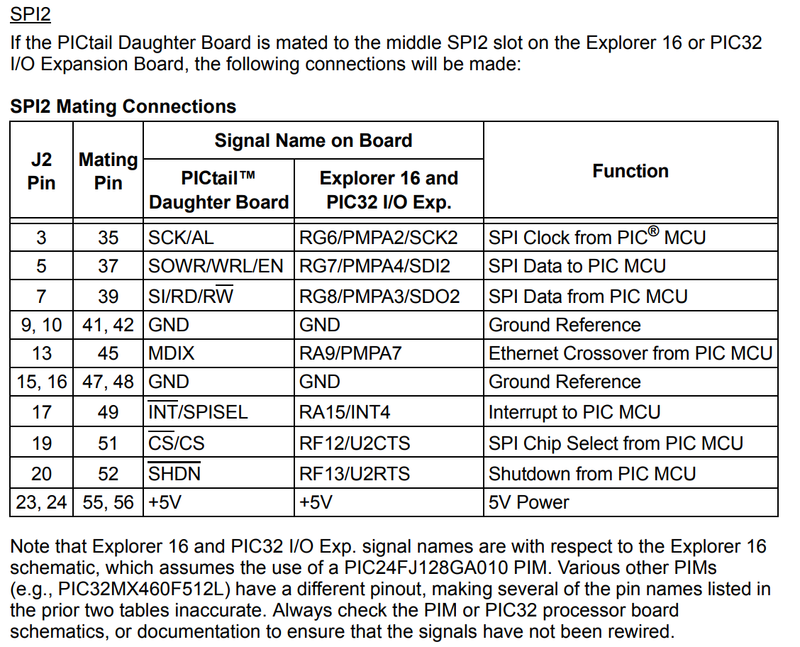 In this step, you will be configuring the SPI driver to communicate with the ENC624J600 PICtail Plus daughter board via the SPI2 serial communications port. 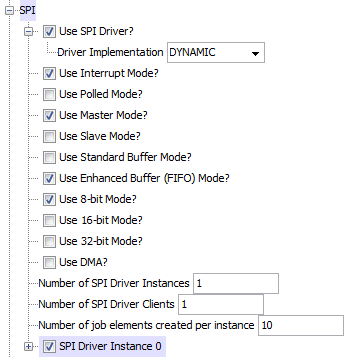 You do not need to assign SS2 in the Pin Table as it was assigned in Step 2.b above. 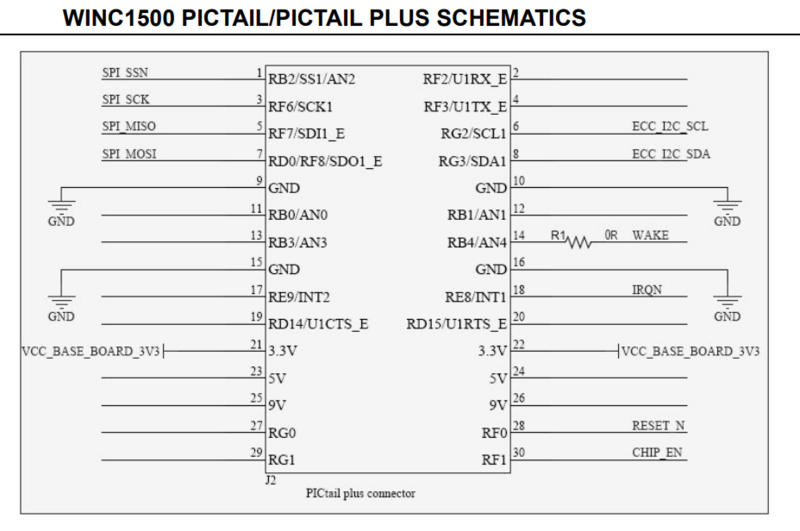 In this step, you will be configuring the External Interrupt to communicate with the ENC62J600 PICtail Plus daughter board. To be used by the ENC driver. Because the ENCx24J600 interrupt pin connects to INT4. Click on Generate Code button in MHC toolbar. In the Generate Project window, select desired 'merging strategy' and click Generate. 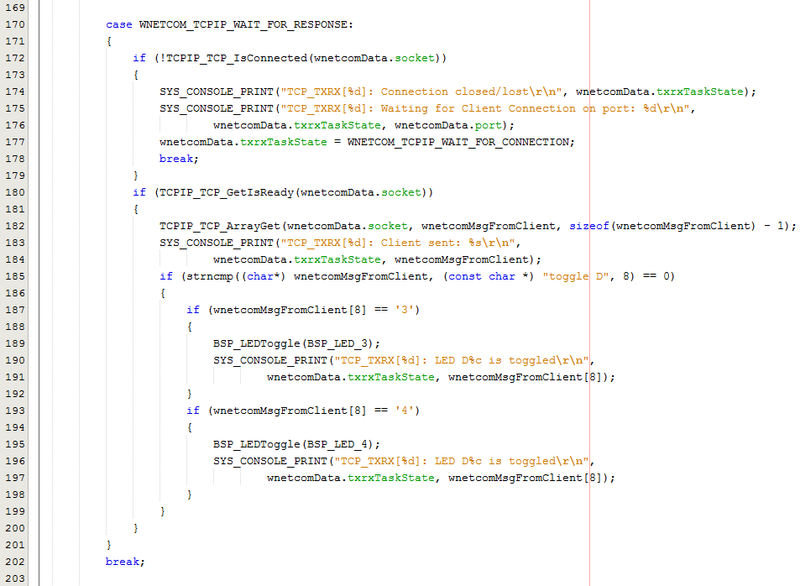 In the merge window, ignore all the differences for wnetcom.c file and click Close. This happens because MHC is comparing a fresh TCP template with your modified one. In order to use the Command System Service to receive commands from the serial terminal, you need to add SYS_CMD_READY_TO_READ() function to the application loop.The function is necessary for the Command System Service and Console System Service to function correctly. You will call it in WNETCOM_Tasks() function in WNETCOM_STATE_SERVICE_TASKS state. Connect the serial port connector on Explorer 16 Development Board to the host computer. Connect the WINC1500 PICtail/PICtail PLUS daughter board in top socket of J5 connector (SPI1). Plug the ENC624J600 Fast 100 Mbps Ethernet PICtail™ Plus Daughter Board in the SPI2 socket connector of PICtail Plus Expansion board. Connect power supply and programmer tool to the Explorer 16. board. 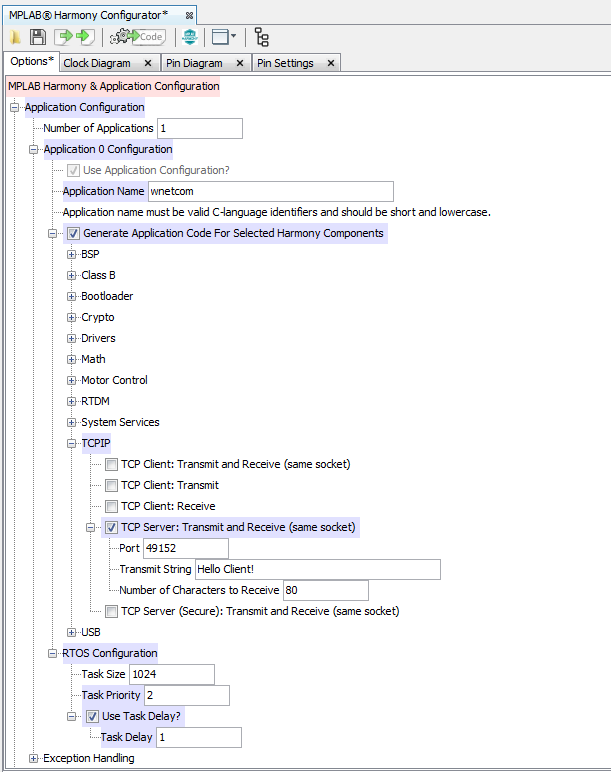 Open Tera Term and select the serial interface instance (see Section V Step 4). Once the PIC32 is successfully programmed, you will see similar messages on the serial terminal as before (see Section V Step 5). 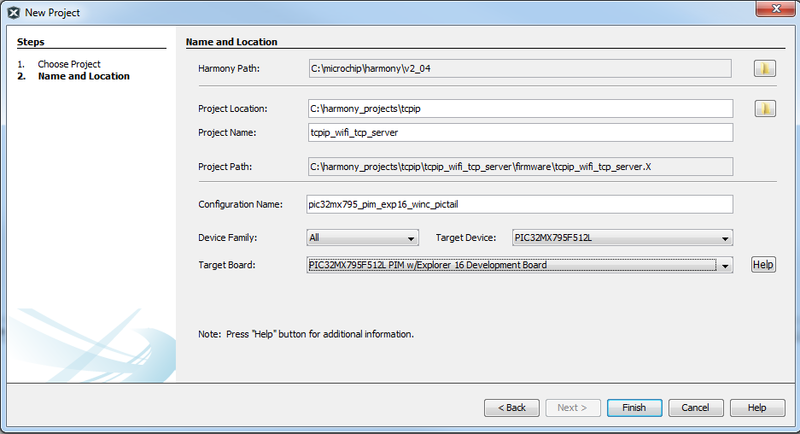 You can make use of TCP/IP Commands available in the Harmony TCP/IP Stack. In the serial terminal, type command netinfo and observe the output. It will show the details of available interfaces and their status. 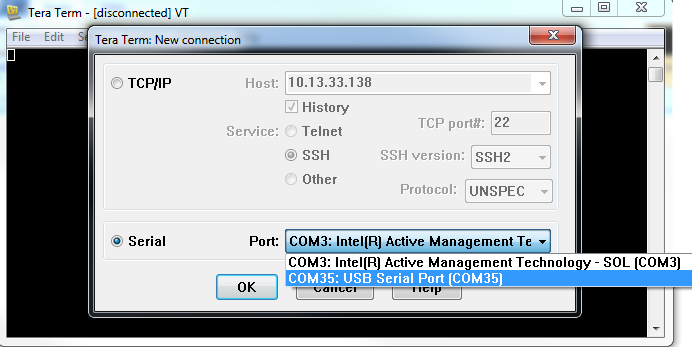 You may notice that the interface names will match with the ones entered in MHC TCP/IP Stack settings. 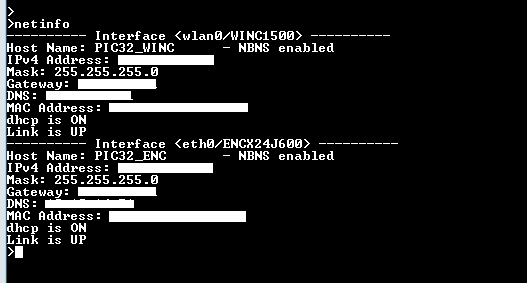 As a simple test, pull out the Ethernet cable from the ENC module and notice the output from netinfo command again. At this point, feel free to modify the socket function call to open the server socket on the desired interface. You may implement two different sockets (TCP Client or Server) listening on different interfaces. Which peripheral can be used for console I/O? For example, on some boards, you might have to use the USB CDC console. 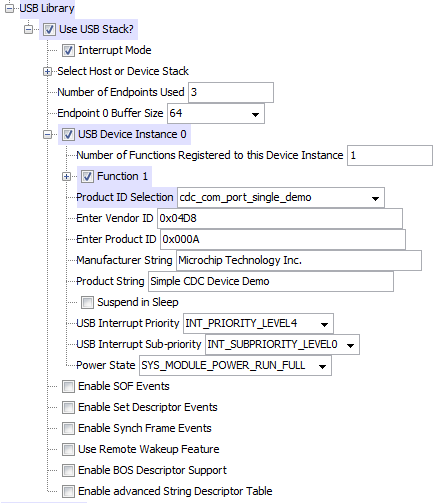 The Product ID selection will populate the Vendor and Product IDs for the USB Device which are necessary for the USB device enumeration. Figure out the connections for your hardware. For example, on the Curiosity PIC32MZEF Development Board, there is a MRF24WN0MA module populated. Figure out how it interfaces with the onboard PIC32 microcontroller. Change the Wi-Fi and SPI drivers accordingly. Please refer to the Curiosity demo available on its product page for more information. Try adding this Wi-Fi or Ethernet driver to an existing project to add connectivity. Visit Microchip Developer Help website (http://microchipdeveloper.com/harmony:start) for more tutorials. This section demonstrates how to map a WINC1500 module pin to PIC32 microcontroller pin. Refer to the three figures below for explorer 16 board, WINC1500 module and PIC32MX plug-in-module. An example of a pin mapping process is also provided after the third figure.